2013 Mercedes Benz SL-Class will be launched in the month of January 2012 at Detroit Motor Show and appears that some found the official brochure of the car, as first images emerged on the internet today. You can check out from the images that the 2013 SL Class is inspired by 2012 Mercedes Benz SLK-Class, however appears that things don’t stop here, as cabin inside follows the same design line like the exterior. Regarding the powertrains, we expect to see the 3.5 liter V6 306 horsepower engine on SL350 and capable to accelerate from 0 to 100 kilometers per hour in 5.4 seconds. The SL500 is expected to get 4.6 liter massive V8 engine producing 408 horsepower and accelerate from 0 to 100kmph in 5.0 seconds. 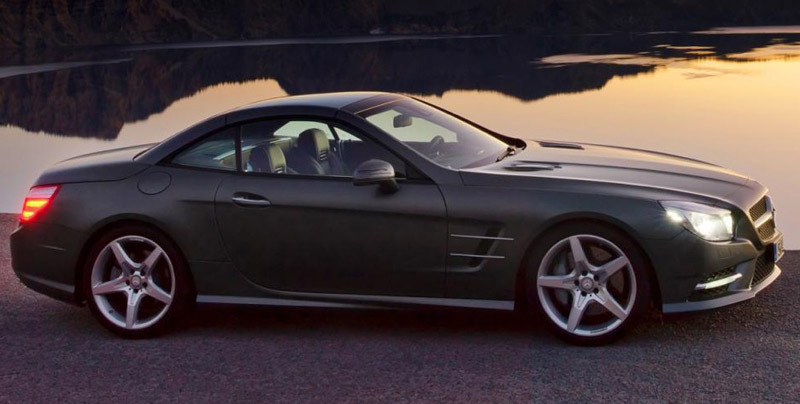 The 2013 Mercedes Benz SL-Class will retain the retractable hardtop capable to transform vehicle from coupe to convertible in less than twenty seconds. The cabin inside is truly a knockout with wing inspired instrument panel and dashboard and cockpit like center console and stack, providing the 2013 SL class a truly premium vibe, almost into hyper-luxury segment of Bentley and Rolls-Royce. The quality of the materials is excellent, as is finish and fit, with entire package combining together in one high-tech and coherent look. The comfortable seats provide brilliant look with sculpted bolsters, in-headrest ducts and detailed surfaces. The 2013 Mercedes Benz SL-Class looks similar to previous model, but gets lower and wider stance. Adding to the changes will be weight reduction offered by aluminium chassis, which allow for enhanced driving performance and fuel economy. It will also be equipped with more upright grille as the company had to change it up because of European rules concerning pedestrian protection. The all new 2013 Mercedes Benz SL-Class will be the company’s model designed and engineered in large series to use all-aluminium bodyshell, which is around 242 pounds lighter as compared comparable steel bodyshell. The SL 500 weighs 275 pounds less than the previous model, while SL 350 weighs above-mentioned 308 pounds, which is less than its predecessor. The model will be equipped with extremely efficient MAGIC VISION CONTROL adaptive windscreen wash/wipe system of Mercedes Benz. As for other details like Mercedes Benz SL Class intricate performance and pricing details are concerned, you will have to wait for another leak of this sort or probably a worldwide launch.